You are reading a sample chapter from the Android Studio 3.2 Edition of this book. An area of user interface design that has not yet been covered in this book relates to the concept of menus within an Android application. Menus provide a mechanism for offering additional choices to the user beyond the view components that are present in the user interface layout. 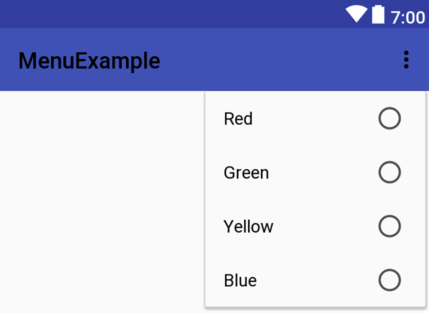 While there are a number of different menu systems available to the Android application developer, this chapter will focus on the more commonly used Overflow menu. The chapter will cover the creation of menus both manually via XML and visually using the Android Studio Layout Editor tool. This property should be used sparingly to avoid over cluttering the action bar. This menu is already configured to be displayed when the user selects the overflow menu on the user interface when the app is running, so simply modify this one to meet your needs. 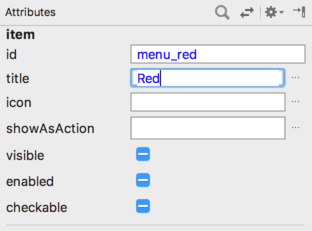 As with the menu XML file, Android Studio will already have overridden this method in the main activity of a newly created Android application project. In the event that an overflow menu is not required in your activity, either remove or comment out this method. When a menu group is configured to be checkable, a small circle appears next to the item in the menu as illustrated in ﻿Figure 40-3. It is important to be aware that the setting and unsetting of this indicator does not take place automatically. It is, therefore, the responsibility of the application to check and uncheck the me﻿nu item. 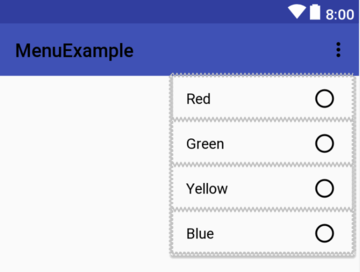 Android Studio allows menus to be designed visually simply by loading the menu resource file into the Menu Editor tool, dragging and dropping menu elements from a palette and setting properties. This considerably eases the menu design process, though it is important to be aware that it is still necessary to write the code in the onOptionsItemSelected() method to implement the menu behavior. The palette (A) contains items that can be added to the menu contained in the design area (C). The Component Tree (B) is a useful tool for identifying the hierarchical structure of the menu. The Attributes panel (D) contains a subset of common attributes for the currently selected item. The view all attributes link (E) may be used to access the full list of attributes. New elements may be added to the menu by dragging and dropping objects either onto the layout canvas or the Component Tree. When working with menus in the Layout Editor tool, it will sometimes be easier to drop the items onto the Component Tree since this provides greater control over where the item is placed within the tree. This is of particular use, for example, when adding items to a group. Although the Menu Editor provides a visual approach to constructing menus, the underlying menu is still stored in XML format which may be viewed and edited manually by switching from Design to Text mode using the tab marked F in the above figure. 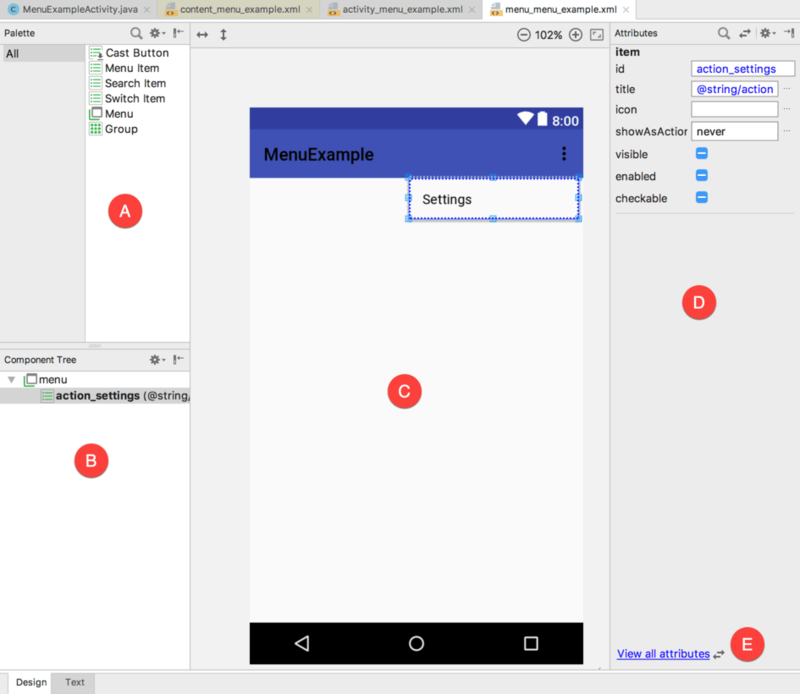 To see the overflow menu in action, create a new project in Android Studio, entering MenuExample into the Application name field and ebookfrenzy.com as the Company Domain setting before clicking on the Next button. On the form factors screen, enable the Phone and Tablet option and set the minimum SDK setting to API 26: Android 8.0 (Oreo). Work through the remaining screens, requesting the creation of a basic activity named MenuExampleActivity with a corresponding layout file named activity_menu_example. When the project has been created, navigate to the app -> res -> layout folder in the Project tool window and double-click on the content_menu_example.xml file to load it into the Android Studio Menu Editor tool. 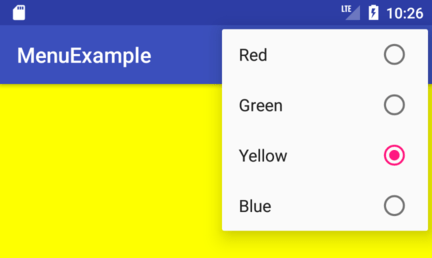 Switch the tool to Design mode, select the ConstraintLayout from the Component Tree panel and enter layoutView into the ID field of the Attributes panel. Within the Project tool window, locate the project’s app -> res -> menu -> menu_menu_example.xml file and double-click on it to load it into the Layout Editor tool. 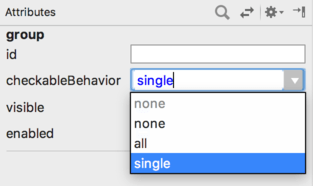 Switch to Design mode if necessary and select and delete the default Settings menu item added by Android Studio so that the menu currently has no items. Build and run the application on either an emulator or physical Android device. Using the overflow menu, select menu items and verify that the layout background color changes appropriately. Note that the currently selected color is displayed as the checked item in the menu. The Android overflow menu is accessed from the far right of the actions toolbar at the top of the display of the running app. This menu provides a location for applications to provide additional options to the user. The structure of the menu is most easily defined within an XML file and the application activity receives notifications of menu item selections by overriding and implementing the onOptionsItemSelected() method. This page was last modified on 14 January 2019, at 18:47.